the gardiner's dirt: Oh Birmingham! On our travels through the deep south we hit up Birmingham next. We had only intended on breezing through. 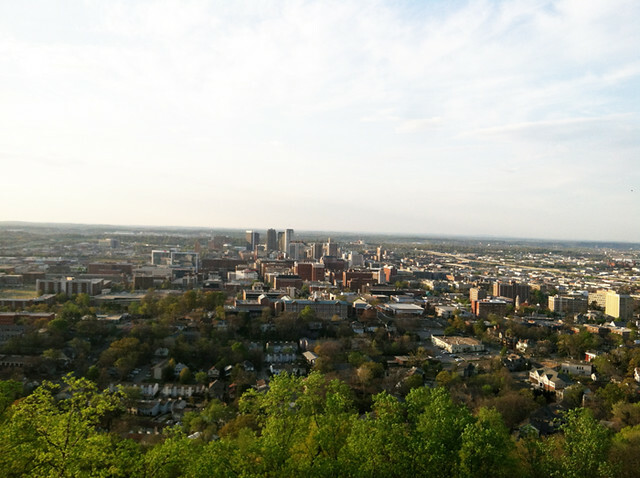 We had a quick bite at a Jimmy Johns then headed over to Vulcan Park. The girls enjoyed cruising through the museum, pressing pennies, and climbing to the top of Vulcan Tower. Well sort of, we learned that Blondes is deathly afraid of heights and had quite the panic attack at the top. MaeMae and Roo on the other hand were running around it giggling and chasing each other as if their feet were still flat on the ground. On our way back to the car, Roo followed right behind her sisters walking on a 3ft rock wall when BAM! She went down. Easy had Rosie and I bolted to my screaming 2 toddler, scooped her up, and assessed the damage. A mouth full of blood and a gash in her lip too deep for my comfort. I pressed her dress on it hard as we thought of what to do. Easy insisted that we "just get it fixed right," and so we all took off down the hill. Luckily the Children's Hospital was right around the corner. I held her in my lap and she insisted that her dress was kept pressed to her lip. I really didn't think I'd be back in a hospital this quick!! Poor girl was so patient and good though. We waited and waited. Easy in the car with the 2 olders + a screaming Rosie and I with Roo. We switched off so I could feed the baby, we fought with the hospital security about parking, gassed up the car, and the girls watched movies while waiting. Roo was alert through the whole thing and watched like a deer in the headlights as the tiny needle pulled the string through her lip. Unfortunately the resident that stitched it was a newbie and it had to be done twice. I was slightly irritated. They told me to try to keep it dry since the stitches would dissolve. So we got a hotel and crashed in Birmingham. With our 2 little stitches. And this time with 2 beds in the room. Our other trip to get stitched here. Ah! That is kind of a trauma and reminds me of when Mae crashed and burned at the community center. Your ladies have a thing for split lips.